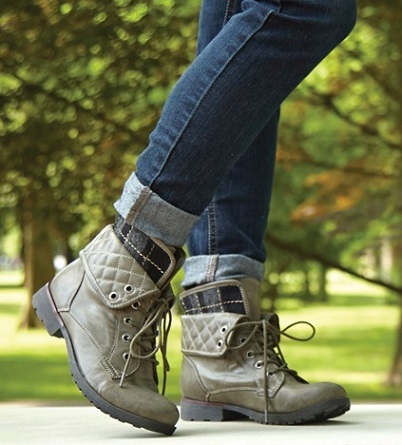 Women's boots that have a hint of men's footwear. You don't have to steal your boyfriends shoes anymore. Now boyfriend boots are made specifically with women in mind. Wear boys that properly fit your beautiful & trendy feet. In fashion design, boyfriend fashion is any style of women's clothing that was modified from a corresponding men's garment. Examples include boyfriend jackets, boyfriend jeans, and boyfriend blazers, which are often more unisex or looser in appearance and fit than most women's jackets or trousers, though still designed for the female form. Boyfriend boots are boots that are designed to properly fit a women but have some aspect of the styling that makes the boot appear similar to a mans boot. You can find boyfriend boots and other types of footwear at shoe retailers such as Bakers, UGG Australia, and many others. Pictured below looks like a mans workboot, but this boot is designed and manufacturered specifically for women. This type of boot can be worn by female construction workers or fashionistas that wish to create a trendy look to be worn with a dress, skirt, or jeans. 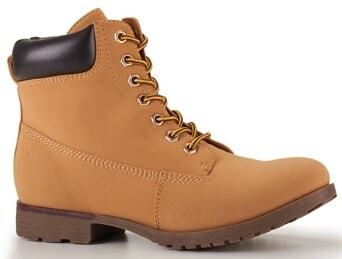 Need a pair of hiker-chic boots? You may want to learn more about boyfriend jeans here in our fashion terms section. Steal is heart, not his fashion. Learn more about boyfriend fashion on our blog.